Leaving Defiance, we used the footpath to cross back over the Maumee River and headed south-west out of town. Our route had us following the Auglaize River to the appropriately named “Junction”, a few houses at the intersection of our road, the 111 and another, larger one, the 637. Our route continued west and down onto some very remote backroads. As we made our way along these backroads, we were wondering if we’d taken the correct turn. Some of the properties we passed seemed really creepy. Most of them were run down and had heaps of old, dilapidated cars sprawled all over their yards. We cycled past very quietly, fully expecting a pack of Junkyard dogs to come flying out at us and knock us off our bikes. If we were ever going to get attacked by dogs, this would be the place! Our luck held out and no dogs were to be seen. We met up with the 111 again just outside the town of Paulding, and our luck ran out! Nearly all the farmhouses here are built right alongside the road, their letterboxes opposite. As I mentioned before, nobody has fences and, being very little traffic on these backroads, none of the dogs have electric collars, or “Invisible Fences” as they’re called, that limit them to the yard and keep them from straying onto the roads. So, as if to chuck us in the deep end, not one but two German Shepherds took flight and launched themselves at us. As we both knew this would happen sooner or later, I’d done some research on the internet as to what to do next. The best advice I found was to stop, get off the bike and use it as a barrier between you and the dog. This seemed a bit counter-intuitive at first, but it came from a few, very experienced cyclists who sounded like they knew what they were doing. So, off the bike I got and kept it between me and them. I got Shazz around behind me and the game of cat and mouse commenced. When they got to the bike the younger of the two lost interest in the hunt and began sniffing the chainrings, the older one wasn’t so easily put off though and tried circling around behind us. He was obviously the one who would bite if given a chance, so I backed the bike around to stop him getting behind us, he barked and growled but kept his distance (about a metre). I whistled and the young one turned to look back at the house, we began walking very slowly keeping the bikes between us and them and after a tense few minutes the dogs lost interest and returned to their yard. Relieved, we mounted the bike again and pedalled off. It was a good win to know this tactic worked, maybe not on every dog, but we now had a tactic we could use that would make us more confident when being chased. We stopped at Susie’s, a lovely family bakery in Paulding and got a coffee and some cakes. It was directly across from the courthouse and Susie herself, along with her friend kept us entertained. Shazz contacted Warren, the keeper of the Community Park where we’d be staying tonight. This would be our first community park where we could stay for free and there’d be toilets open for us. We passed through the town of Payne and then crossed the border into Indiana, no signs to welcome us though. 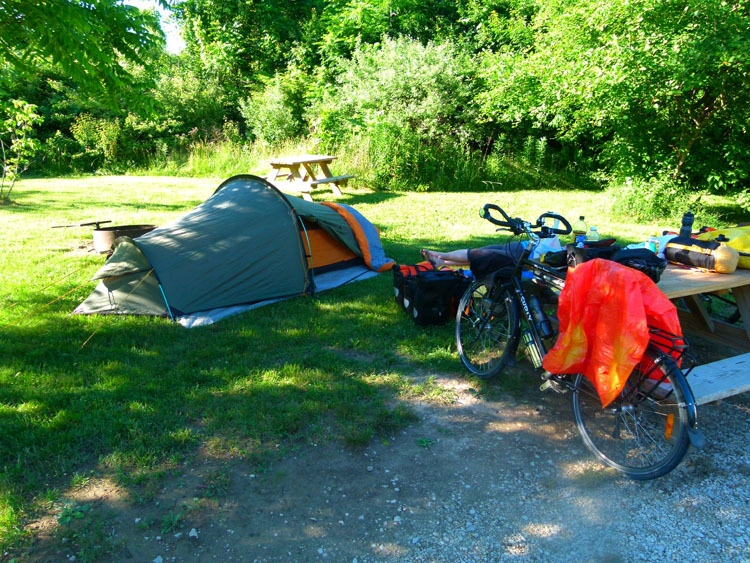 Most small towns have a community park and allow cyclists to camp in them and use the facilities for free. These small towns have recognised cyclists as an alternative source of income, as they stop and spend money on dinner and supplies for their journey. We love the idea as it gives us a chance to stay and meet the locals, usually at the pub. That in itself can lead to anything from a free beer to offerings of accommodation and another story to tell. That’s what it’s all about for us and we’ll be making sure to stay in as many community parks as we can. Monroeville’s Community Park has a huge hall, which our new friend Warren opened up for us and told us we could camp on the floor inside, no need to pitch a tent. That was awesome! 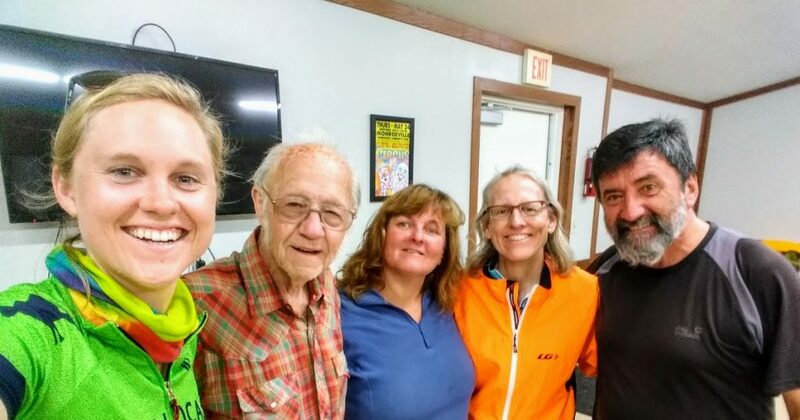 Later on, we met some other fellow cyclists, Annie and Jane, a mother and daughter who were cycling to Iowa where Jane would start college. 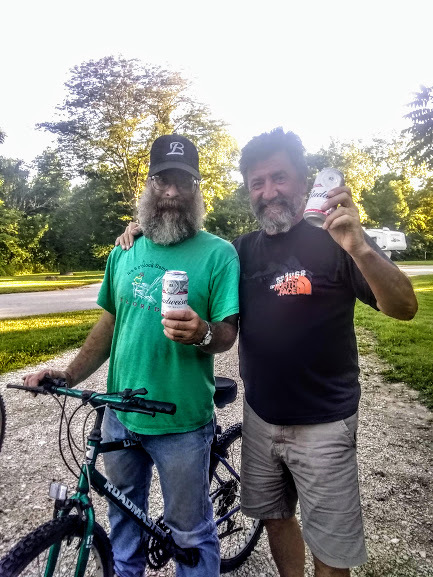 They had cycled from Grand Rapids in one day, the same thing we’d just taken two days to complete! We were in awe, what a long day in the saddle, but they were on a tight time schedule and needed to rack up the kilometres. Indiana had different liquor laws than the other states and going to the service station for a beer, much to my surprise, left me empty-handed. I ventured into the seedy looking bar next door, and after chatting with a few locals at the bar, found out I needed to go to the liquor store across the street if I wanted to drink something more adventurous than Bud or Coors Light – I did! I also cycled back to the supermarket and got us something to eat for dinner before enjoying a hot shower at the Community Hall. We sat outside under the large shelter and ate our dinner and watched the local kids train for baseball. Shazz checked the weather for tomorrow, not good, strong westerly winds! Oh no! We got up early and found Annie and Jane having breakfast in the local diner chatting with the locals. I never even heard them leave and was surprised to still see them still here instead of being way down the track. They still managed to get away just before us and we didn’t expect to see them anymore after that as they go way faster than us. We set off south from Monroeville for only one km before turning west into the stiff wind. We’d learnt long ago that fighting the wind is a battle you can’t win. We’d just have to take our time and gear down. We were reduced to cycling 12kms/hr, a lot slower than our normal 17kms/hr, but we knew we didn’t have to press it as we had ample daylight left, the sun wasn’t setting till around 9.15pm nowadays. 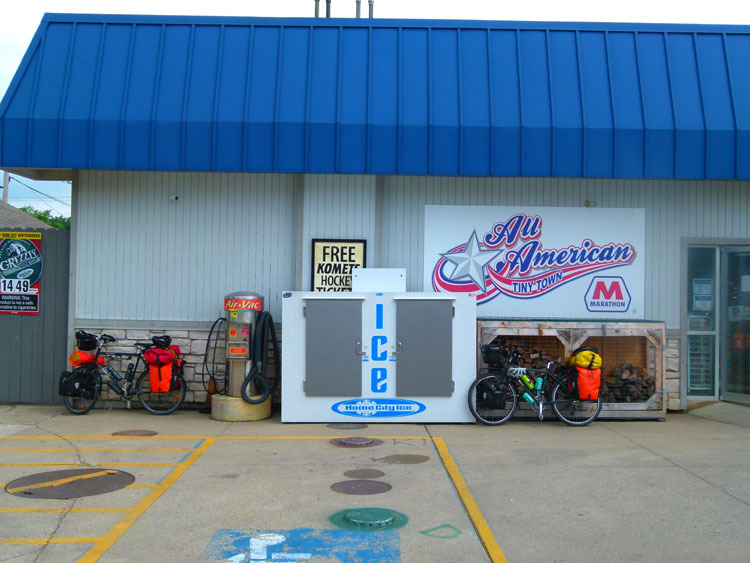 We battled along until we reached Zanesville where we saw the girls’ bikes leaning against the side of the general store. The intersection was blocked with barriers and a detour sign pointed us in another direction, so we figured it was time to eat and see if we could get directions back onto our route. We chatted with the girls a while and the store owner showed us another, better way, out of town. Once again today, we bade the girls goodbye and ate our sandwiches. There was no hurry, despite the nasty headwind, we had made pretty good time so far. 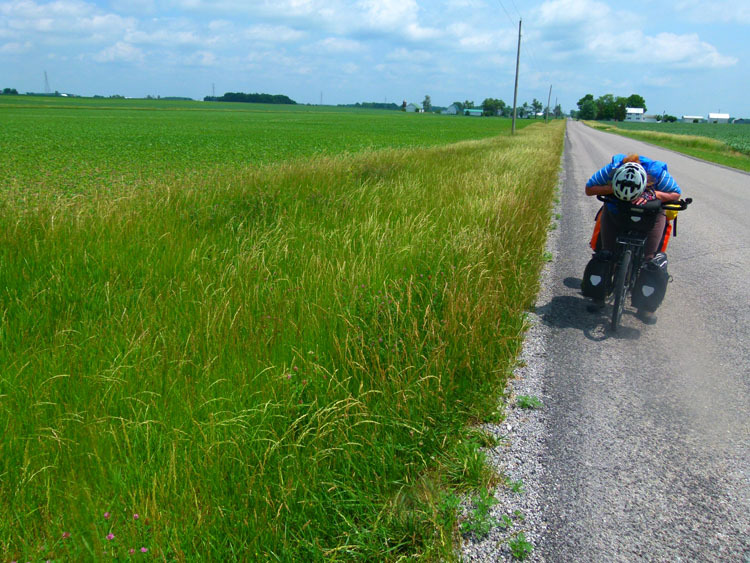 From Zanesville, we turned south-west and away from the headwind a little. It was noticeably easier straight away, we were both relieved. We were both still quite tired though, and a couple of big hills ensured we’d sleep pretty well tonight. Almost there, I sent Shazz on ahead while I cycled down the road towards Huntington and a BP service station we’d seen on the map. I figured I’d get a few beers and something to eat as the State Park was only a primitive campsite (drop toilets, no shower or shop). The BP was about 6kms down the road against the headwind, so I wasn’t too happy to find that they didn’t sell beers! Gutted, I bought something to eat and some soft drinks and headed back, cursing Indiana and their archaic drinking laws. I found Shazz waiting for me in the shade, there were plenty of free campsites, so we chose one and pitched the tent next to a picnic table. The tree next to us provided some much-needed shade as we laid out the tarp and rested our weary bodies. A little later, a guy rode by with his wife and son and wanted to know about our bikes and our trip. After the usual story, I happened to mention that I’d ridden down to the BP for nothing trying to find a beer. He laughed as if I was telling him a joke and they said goodbye and rode off. About an hour later, I sat staring at a soft drink that was way too sweet and undesirable. I heard someone call my name, looked up, and here was this fellow standing there with 2 beers in his hand. He said he had plenty and couldn’t see why we shouldn’t have one too after our arduous day. I nearly kissed him, I was so happy! We got him to pose with him for a photo and, just as he’d appeared, he was gone. He had made my day, it was only one beer each, but it was the thought that counted for me. I almost inhaled the whole thing in one go anyway.